As you all know – because I have complained about it often enough – there is a construction site next door, where the shopping mall is enlarged considerably. Every time I pass by, I marvel at the efficiency of the work crew and how quickly they are getting things done. 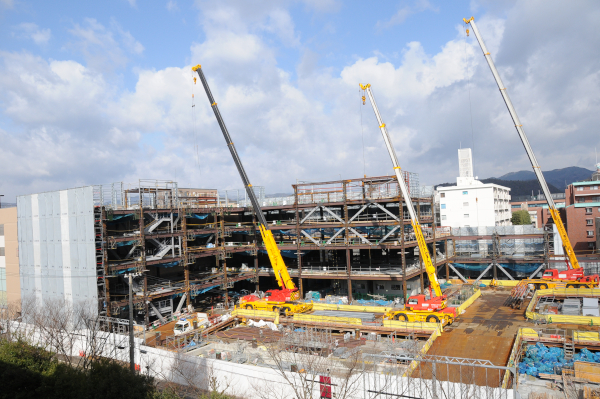 By now they are starting to erect the steel frame, and they are very fast in doing so. I took the photo below last week, and they have already put up a new section. One of the guys guarding the gates knows me already and we chat every now and then when I try to get a closer look. He said that the new mall is supposed to open in December this year, and by the looks of it, they are going to achieve this.